Time to replay the trilogy again, I guess. 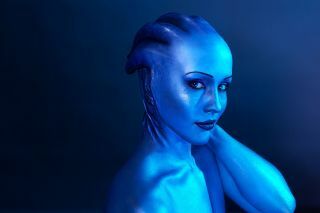 There's one particular photo of Jennifer Pryer as Liara T'Soni from Mass Effect that gets reposted on Reddit pretty regularly. It's appeared repeatedly on r/gaming and r/masseffect with titles like "Liara cosplay! Her eyes make the whole thing" or "Jaw-dropping Mass Effect Cosplay" over the last four years. It is an impressive shot, but it's a photo taken from a makeup test depicting her first attempt at the scalp-crests, while wearing an N7 t-shirt rather than one of the full costumes for the character she'd finish making later, and without the darker lips the Asari have in the games—as commenters are always eager to point out. Though it's earned thousands of upvotes for the people who post it without crediting her, Pryer seems a little embarrassed by the photo. She recently posted a more accurate version herself "to save my nerd cred". It features Liara's armor, a newer version of the headpiece, which is made from foam latex rather than regular latex and painted inside a plaster cast to make a wearable slip mold (you can watch a video of it here—yes, the hair tentacles move), and of course, lipstick that will prevent people in the comments from saying "well, actually" at her. Professional photographer Lark Visuals also took some recent pictures of Pryer in the latest version of her Asari makeup, which apparently takes her three or fours to put on before a convention appearance or photo shoot. It paid off when BioWare tweeted it, quoting Liara's line from Mass Effect 3, "Well, I suppose I did just write your name in the stars." Which is nice. Pryer's also cosplayed as Ciri from The Witcher 3, a Qunari Inquisitor from Dragon Age: Inquisition, and both the vampire Serana and a thief in the Nightingale armor from Skyrim. You can check those out on her Instagram.